There are 17 Assisted Living Facilities in the Punta Gorda area, with 6 in Punta Gorda and 11 nearby. The average cost of assisted living in Punta Gorda is $2,590 per month. This is lower than the national median of $3,346. Cheaper nearby regions include Englewood with an average starting cost of $2,563. To help you with your search, browse the 197 reviews below for assisted living facilities in Punta Gorda. On average, consumers rate assisted living in Punta Gorda 3.8 out of 5 stars. Better rated regions include Port Charlotte with an average rating of 4.1 out of 5 stars. Caring.com has helped thousands of families find high-quality senior care. To speak with one of our Family Advisors about assisted living options and costs in Punta Gorda, call (855) 863-8283. When Punta Gorda was founded on the shores of Peace River in 1884, every waterfront block was a park. Haborwalk continues this legacy with a walk along the Charlotte Harbor shoreline, which may appeal to seniors who enjoy waterfront strolls. Over 55 percent of the city's 19,000 residents are aged 65 and older and there are 17 assisted living facilities in the area offering them accommodation. These facilities are licensed by Florida's Agency for Health Care Administration. The Punta Gorda area is home to world-class medical facilities, including Bayfront Health, Punta Gorda, in the event of medical emergencies or illness. Charlotte County Transit Division offers a curb-to-curb bus service throughout the county, including Punta Gorda. Seniors aged 60 or older can apply for the Transport Disadvantaged Program, which provides eligible riders discounted fares. Punta Gorda has a relatively low overall crime rate of 13 crimes per 1,000 residents, lower than 80 percent of Florida's other towns and cities. The property crime rate is around half of the state average. Violent crime is similarly low at less than one crime per 1,000 residents, compared to the Florida average of 4.08. This may reassure seniors who are concerned with their safety. There are many opportunities for seniors to enjoy art and culture in Punta Gorda. The Visual Arts Center has exhibitions, workshops and events, including the Peace River National Art Festival. Those interested in the area's history can get involved with the Punta Gorda Historical Society or the Punta Gorda Historic Mural Society, which aims to preserve the history of the area through mural art. The overall cost of living in Punta Gorda is rated at 103 on the Sperling index, compared to the national average of 100. This is largely due to the cost of housing. While groceries are pricey, seniors can save money on utilities, transport and healthcare which are all less expensive than the U.S. average. Punta Gorda has 267 sunny days each year, 62 more than the national average. In July the average high is 91 degrees and in January the low is around 52. The warm year-round climate allow seniors to spend more time enjoying the outdoors. Assisted Living costs in Punta Gorda start around $2,590 per month on average, while the nationwide average cost of assisted living is $4,000 per month, according to the latest figures from Genworth’s Cost of Care Survey. It’s important to note that assisted living rates in Punta Gorda and the surrounding suburbs can vary widely based on factors such as location, the level of care needed, apartment size and the types of amenities offered at each community. Seniors in Punta Gorda who receive income from Social Security may be eligible for the Optional State Supplement. 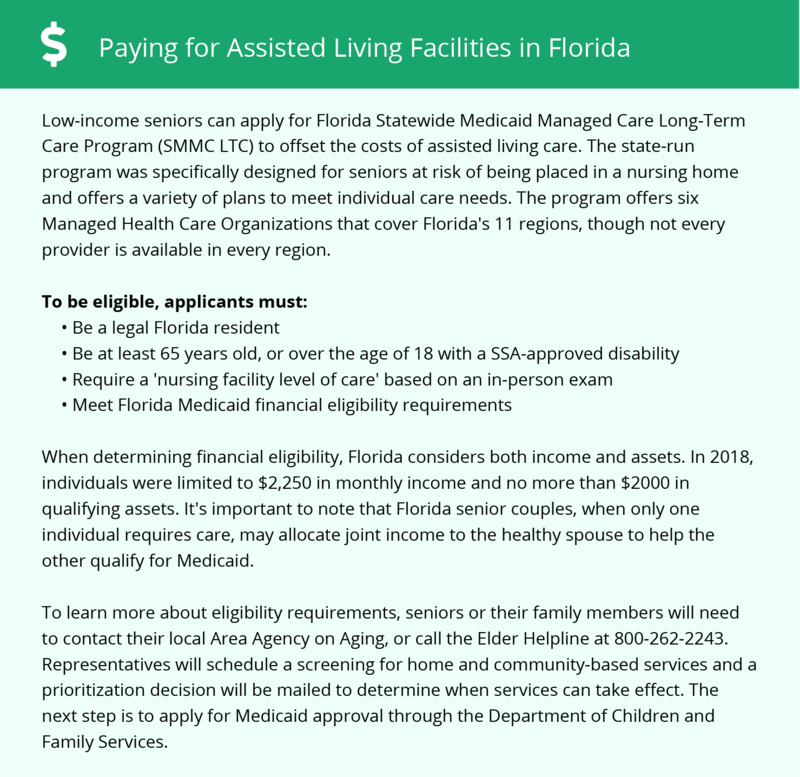 Financial assistance is also available to seniors in assisted living through the Assistive Care Services waiver or the Medicaid Long-Term Care Program. Punta Gorda and the surrounding area are home to numerous government agencies and non-profit organizations offering help for seniors searching for or currently residing in an assisted living community. These organizations can also provide assistance in a number of other eldercare services such as geriatric care management, elder law advice, estate planning, finding home care and health and wellness programs. To see a list of free assisted living resources in Punta Gorda, please visit our Assisted Living in Florida page. Punta Gorda-area assisted living communities must adhere to the comprehensive set of state laws and regulations that all assisted living communities in Florida are required to follow. Visit our Assisted Living in Florida page for more information about these laws.